1996: The City of Asbury Park has received a $1.24 million NJ Trust grant for restoration of the water tower on Convention Hall. They have also funded a new organ for the Paramount Theatre with a $12,000 Urban Enterprise Zone grant. 8/00: The New York Times has published an article reporting that the Asbury Park real estate market has picked up due to new-found popularity with the gay community. 12/00: Boardwalk landmark Palace Amusements has been listed on the National Register of Historic Places. 2002: Palace Amusements has been sold to Asbury Partners, the same developer that has just signed contracts with the city to oversee the Waterfront Redevelopment Plan. 2004: Palace Amusements has been demolished. 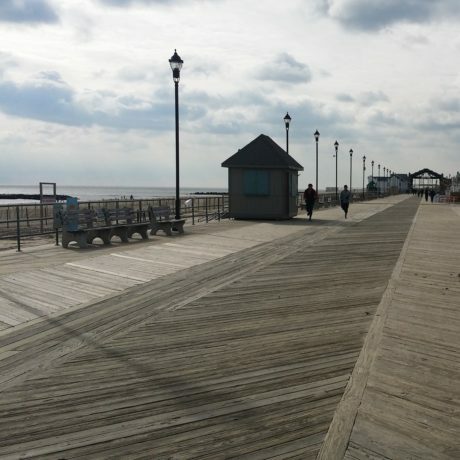 The New Jersey CAFRA permitting process failed to adequately protect this resource- the state issued the CAFRA permit, which included demolition of Palace Amusements, earlier this year. The Asbury Park Boardwalk is listed as an official “Save Americas Treasures” project. 8/2010: Revitalization is making headway, albeit slowly, in Asbury Park. Convention Hall has been completely restored and is now home to a number of boutiques and restaurants, and the Paramount Theatre, which is regularly booked with popular acts and shows. Howard Johnsons’ has been renovated and has reopened under a new name. Numerous new low-rise buildings have been built along the Boardwalk, hosting small shops, food stands, and amusements, including the Silverball Museum and Pinball Hall of Fame- a throwback to Asbury’s amusement heyday. The Casino Building remains vacant, although its arcade is now open and passable. The carousel building hosts summer theatre and the occasional festival, but remains without a permanent use. In the early twentieth century, Asbury Park was the leading seaside resort on the northern New Jersey coast, surpassed statewide only by Atlantic City. The Boardwalk, fully developed by the late 1920s, is the most tangible remains of this period. Convention Hall and the Casino, anchors of the Boardwalk, include a theater, two exhibition halls, two arcades through which the Boardwalk passes, and numerous shops. Convention Hall and the Casino are significant examples of civic oceanfront planning. Both were designed by the prominent New York firm of Warren and Wetmore, architects of Grand Central Terminal. The City has been in a prolonged period of depression with a tax base greatly diminished in the years since WWII. A major redevelopment plan for the beachfront area has resulted in the loss of nationally significant resources and more are in danger.